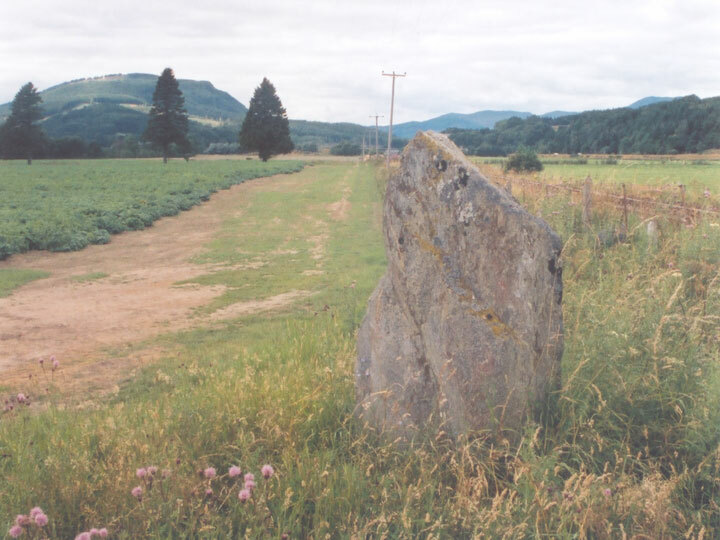 The Clach Glas is not too far from the embankment for the railway on the flood plain of the Tay. It is around 1.7m tall by 1.0m wide, and is approximately 30cm thick, making it slab-like in appearance. It stands on a small but pronounced mound in which packing material is visible, and there was said to have once been more stones lying on the ground to the south and east, although these are no longer there. In the centre of the south face of the stone are two cup marks. Clach Glas is in the parish of Logierait and the county of Perthshire. Published on the 14th of May 2010 at 4:19 pm. Updated on the 31st of March 2011 at 6:26 am.